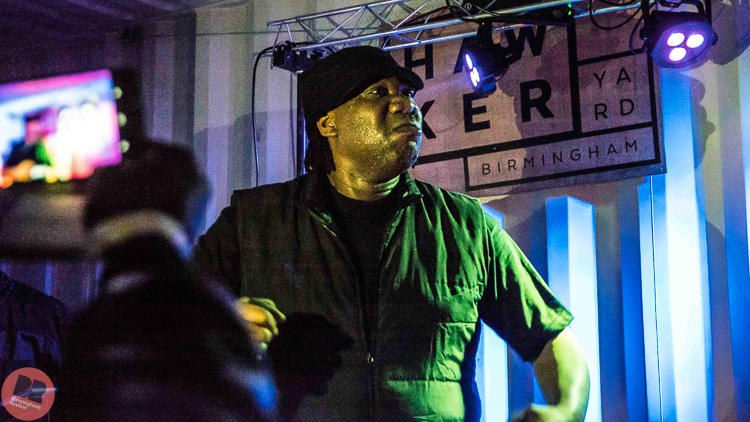 Hip hop veteran, KRS-One, arrives in Birmingham to close his six date UK tour, for what’s been described as an exclusive and ‘intimate’ show at Hawker Yard. When it comes to gigs, I’ve always taken the term ‘intimate’ to mean ‘artist playing in smaller setting than they normally would’. 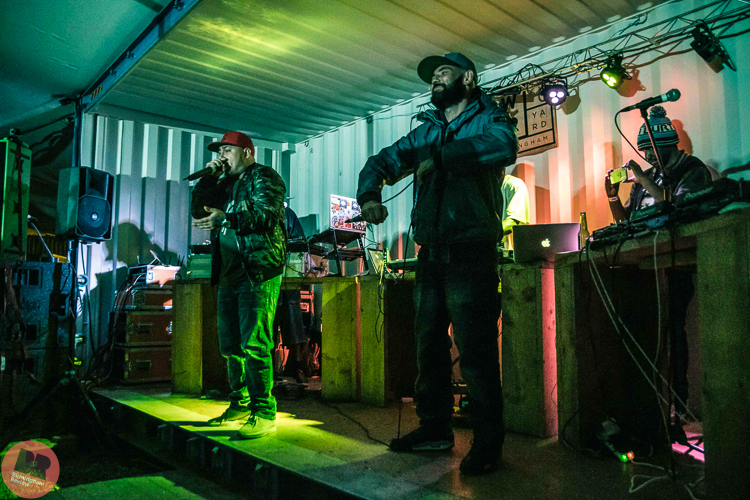 But as I look at Hawker Yard for the first time – with it’s tiny, wooden stage and tented roof covering a pebble-floored area no bigger than a local pub – I realise that intimate, in this case, really does mean intimate. 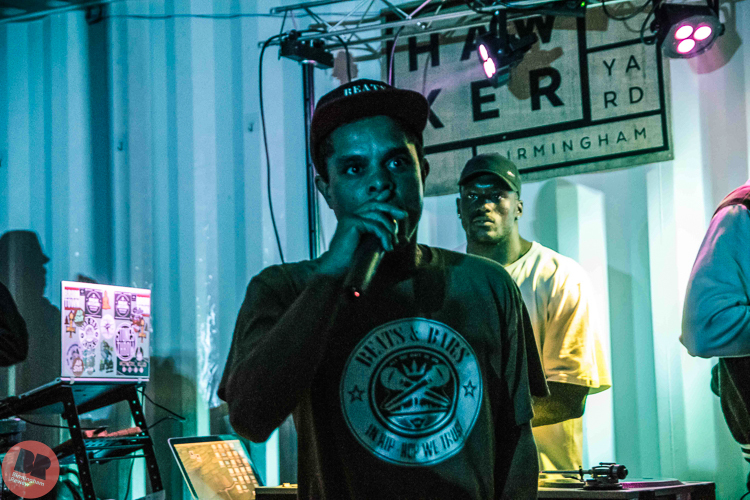 The evening has been warming up with DJs from the monthly Feel the Vibe nights at Hawker Yard, with kids break dancing in the middle of the floor, reminiscent of hip hop in the 1980s, only with a boombox missing. 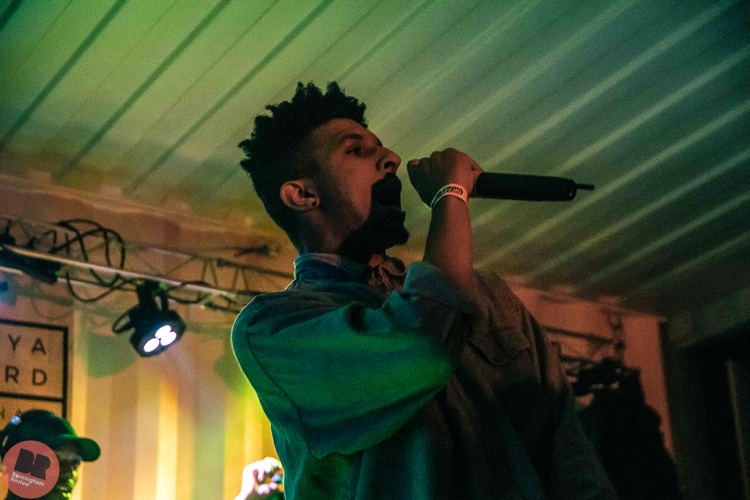 The live sets start at around 9pm – kicking off with Omen, then followed up by Maxi Zee from Germany. 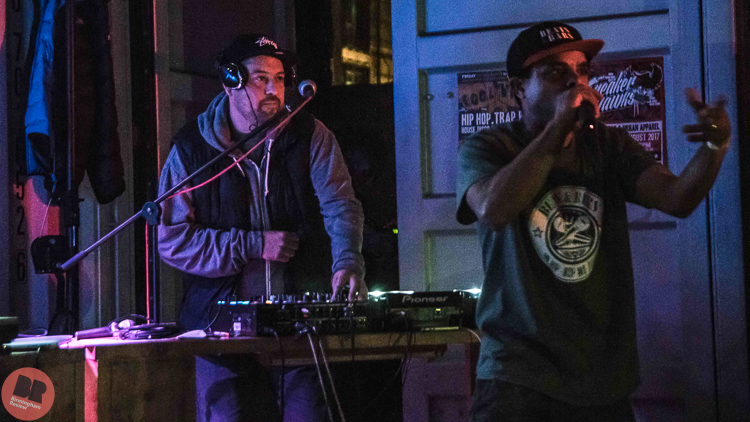 They had 15 minutes of stage time each, but it was enough time for both acts to make an impression on the Hawker Yard crowd. 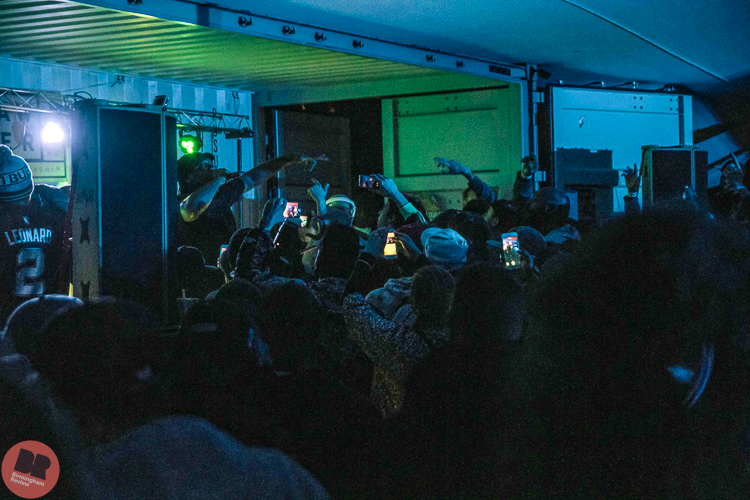 At this point in the night, I had enough room by the stage to take photographs, but the moment Trademark Blud came on stage I knew that things would get even more difficult for me when KRS-One shows up. 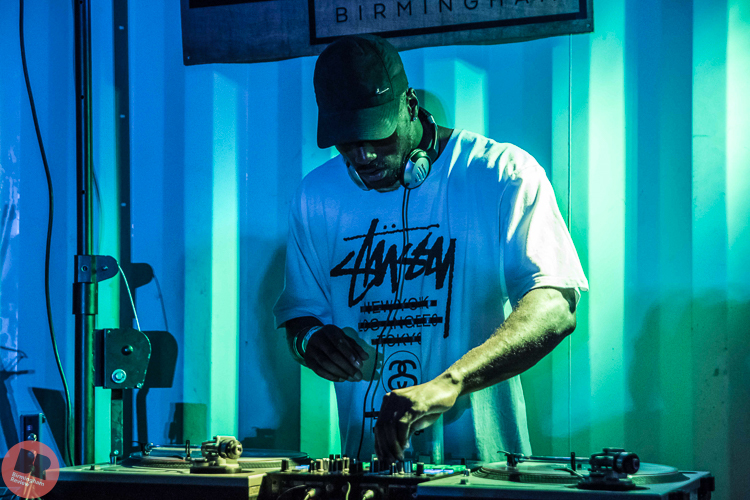 Trademark Blud, supported by his beat maker and DJ, Tricksta, captivates minds with his hard hitting, politically conscious brand of hip hop. 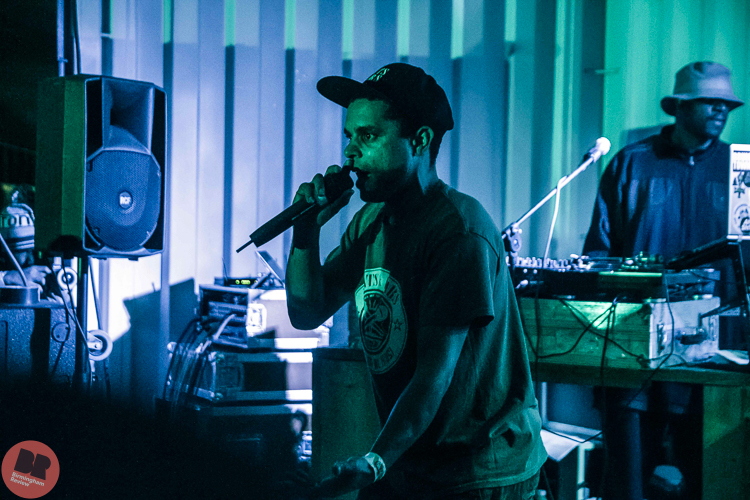 I restrict my photography by retreating away from the stage as more people are towards it. 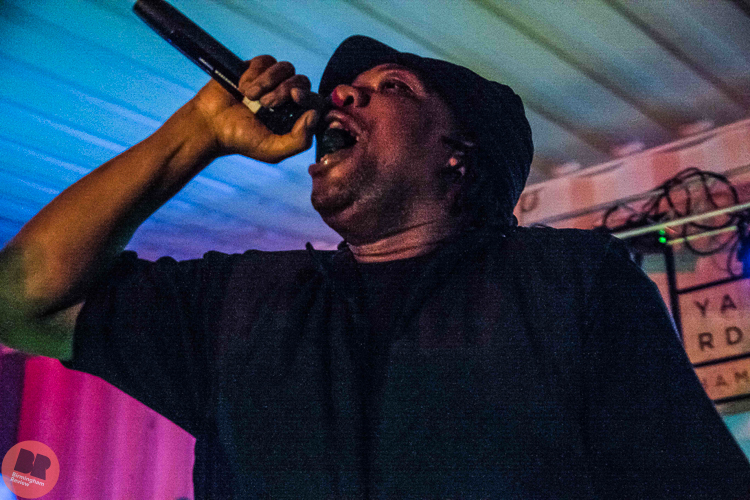 Whilst watching Trademark Blud rapping frenetically, I strategise just how I’m going to take photos of KRS-One in a closed setting like this. The moment Trademark Blud leaves the stage, I make my way forwards and occupy the small gap left between the audience and the front of stage by squatting there. This spot is mine. And whilst I may make this sound uncomfortable, the truth is that it feels very relaxed; Hawker Yard just has a really friendly vibe, much like a community where you are simply made to feel welcome. 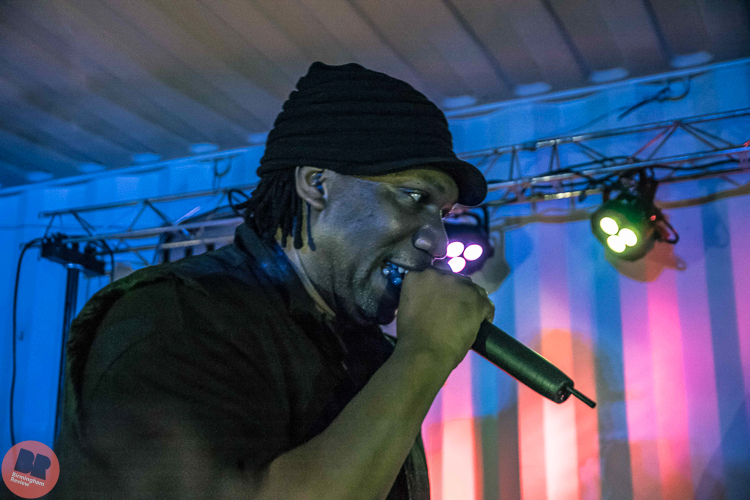 The man of the night, KRS-One, takes to the stage. 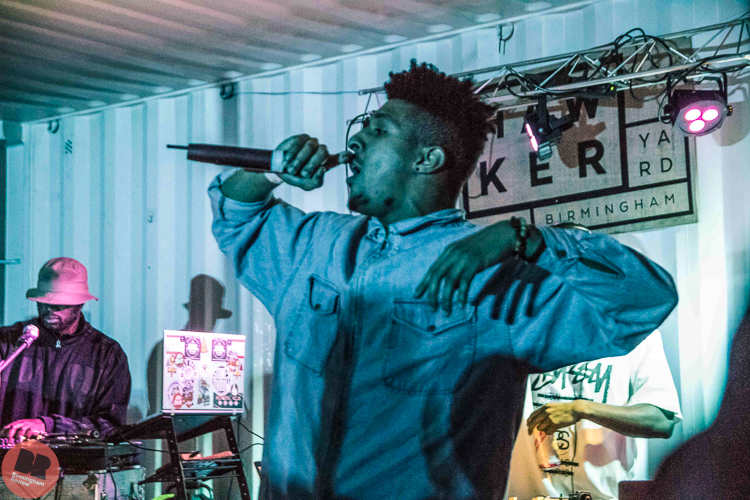 Wildly glaring at the audience, and looking to make this a big night as Birmingham is the city he is closing his UK tour with. I take as many shots as I can before he even begins his first song, as I know it’s going to get rowdy as the night progresses. KRS-One points to the area I’m occupying and says “It’s empty here” encouraging the audience to move closer to him, which they do with little hesitation. 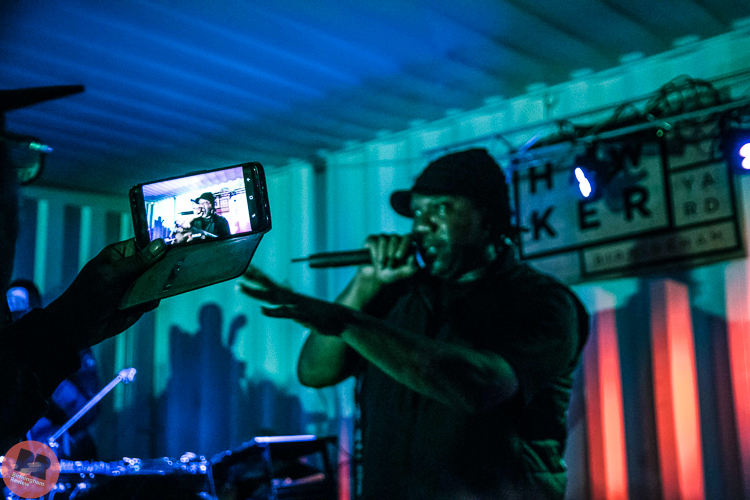 I spring up like a meerkat to avoid being trampled on, but I’m very much stuck in between people, all with their phones held high, capturing the moment that they were all standing right next to KRS-One. I’m smiling throughout all this, mainly because I’ve never had this experience as a photographer; as if the low light wasn’t challenging enough, try getting any clear shots of an artist when squeezed in between so many fervent fans. Wanting to get a few more crowd shots I retreat from the front, checking at the images at the back of my camera to make sure I’m happy with what I’ve got, as once I’m out there will be no return. And I had expected ‘Sound of Da Police’ (taken from KRS-One’s first album, Return of the Boom Bap) to be left until last, but fortunately for me it wasn’t so I could take my leave from the front after that. But the whole idea of being a concert photographer is capturing these moments as they are. 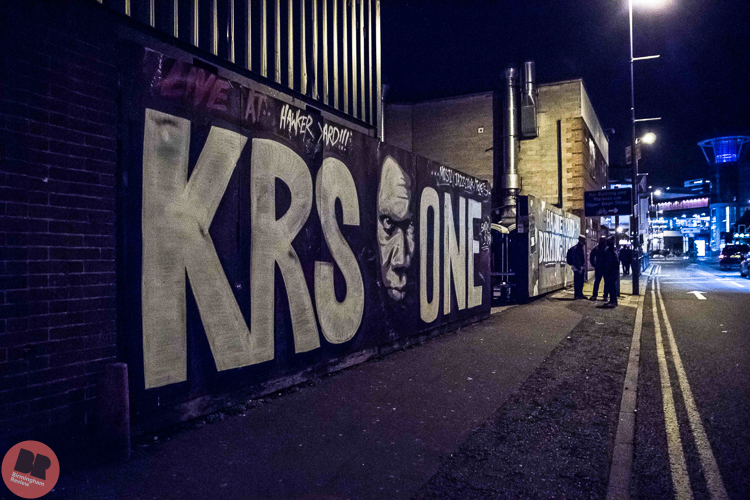 And that’s what these photos from KRS-One at Hawker Yard represent – a night where there is no stage, or status barrier between artist and audience, but one where a venue is simply united by hip hop.